She frowned at him, confused. Was this the same man she’d spent years with? The man she still loved even now? The man who’d made it his life’s calling to help people unjustly imprisoned for no other reason than they had paranormal abilities? Something else was going on here. Even if his brother was a ‘brat,’ whatever that meant, surely Petro couldn’t believe he deserved to be jailed, or worse. “So you won’t even try to help him?” she asked, uncomprehending. If he kept running his fingers back through his hair like this, it might remain stuck upward permanently. His eyes pierced her, looking deep within her, and she could see the fire of the dragon inside him. She suddenly longed to fly with him again. It took all she had in her to stomp on that idea. She flinched back as though he’d slapped her. He’d never raised a hand to her, never even raised his voice, but this accusation hurt more than a physical blow. The metallic edge of desperation crept into that question. He wasn’t hiding how he felt anymore, his pain was engraved in every line of his face. 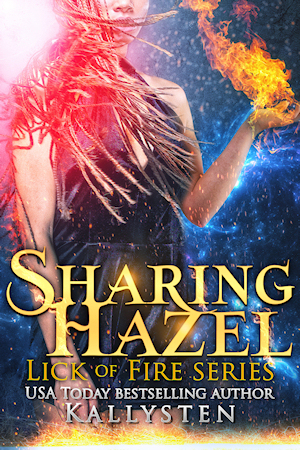 Guilt twisted inside Hazel’s gut like a living thing until she thought she’d be sick. How could she answer without making everything worse? She took a deep breath to clear her mind a little and reached out to him, taking his hand and squeezing it lightly. She gave another gentle squeeze before letting go. When Petro didn’t reply, she figured that was his answer. She started for the door, but before she could retreat to her bedroom Petro finally spoke. Now this was more like the Petro she knew, organizing and making plans on the fly. It sounded to Hazel that this last bit was an excuse to be alone with her, but she’d offered her assistance; she wasn’t going to argue about the conditions now. She nodded. She offered him a brief smile before turning away once more, but he wasn’t done. His voice was back to that blank canvas on which she couldn’t discern any emotion. She didn’t trust herself to speak, so she simply nodded again without looking at him. But Petro still wasn’t finished. The mere fact that he was raising the issue gave her a good enough idea of the answer. The last thing she needed right now was confirmation. As she finally left the room, she felt like she was walking on a ledge, and any misstep would send her plummeting into untold depths. She was barely aware of entering the small bedroom she’d claimed as her own earlier or even of sitting on the bed. She unbuttoned her shirt, sliding one arm out of the sleeve to expose the leather cuff on her wrist. She tugged the cord holding it in place loose and slid it off. Right there, on skin ever so slightly paler than the rest of her forearm or upper arm, a large, unadorned P stood right under the edge of her wrist. Next to it, smaller letters arranged on three parallel lines completed the names. These three names had haunted her ever since she’d truly understood what a tattoo mate was. Three names that her parents had categorically forbidden her to reveal to anyone. Three names she’d both hoped and dreaded to hear since her late teens. She’d met Petro first. Paris had been next. And now, it seemed, she would finally meet Paul. If her name was on his wrist, she suddenly understood why Petro had never mentioned that he even had a brother. It might also be why he’d been so insistent about seeing her wrist when they’d started dating, and why he hadn’t seemed surprised in the slightest when she’d finally shown him the three names there. He’d known, hadn’t he? Or at least, he suspected. He’d known since Paul’s birth that he and his brother had the same name tattooed on their skin, and he’d had time to think about what it might mean. “I won’t share you,” he’d said before she even met either of the two other men whose names she carried with her at all times. “I won’t ask you to,” she’d answered with a forced laugh, because even considering having more than one mate had always been beyond her. That was why she’d made a choice when Paris had entered her life. Would she have to choose again once she met Paul?